"during bull markets since 1945, the S&P 500 experienced a pullback (a decline of 5.0%-9.9%) once a year, on average,"
"a correction (a 10% to 19.9% decline) every 2.8 years, and,"
"a bear market (-20%+) every 4.7 years." "the S&P 500 suffered a YTD price decline in more than 80% of all years in which the S&P 500 recorded a positive annual performance since WWII." 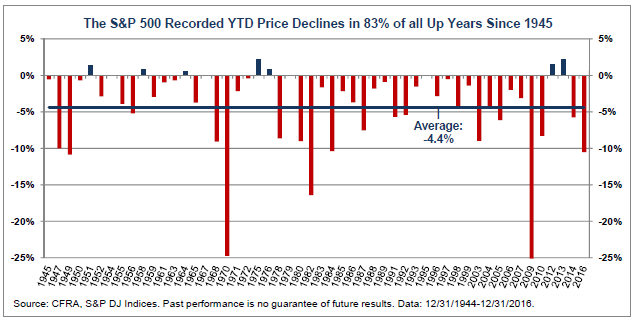 As further proof that the market does not move higher in a straight line, the CFRA report notes the S&P 500 Index incurred a year-to-date price decline in 83% of all up years since 1945. Also interesting in the report is the fact that 70% of all year-to-date declines occurred in the first quarter of the year and approximately a third of all the year-to-date declines occurring in January. The entire report is a worthwhile read as it contains data on the market's performance after surpassing millennial points. 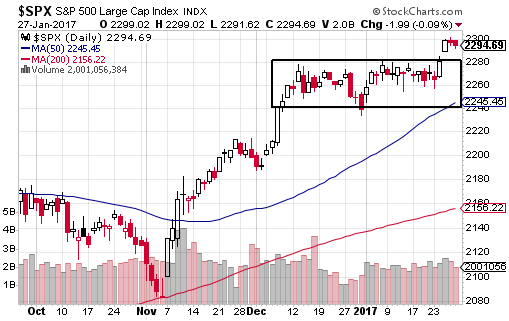 Over the course of the last three trading days this week, the S&P 500 Index and Nasdaq broke out of the trading range in place since mid December. We highlighted this range in a recent post that noted sizable corrections are unlikely when earnings are improving. 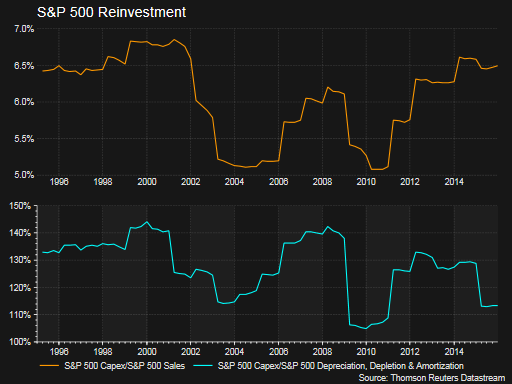 The below chart shows that through the end of 2015, S&P 500 companies were contributing a similar percentage of revenue to capex as they were back in 1995 (6.495% in 2015 vs. 6.5% in 1995). This same percentage capex contribution, however, is now only covering 113.4% of depreciation, when it covered 132.73% at the end of 1995. If the contrarian individual investor sentiment measure reported by the American Association of Individual Investors indicates anything, individual investors seem to be questioning the sustainability of this market rally. Because the Sentiment Survey is a contrarian measure, just maybe the market advance has further upside. In AAII's report this morning, bullish sentiment fell 5.4 percentage points to 31.6% which is nearing an extreme for the reading. Most of the decline in bullish responses showed up in the neutral reading as it increased 4.6 percentage points to 34.9%. This is the highest neutral rating since it was reported at 42% in early November of last year. 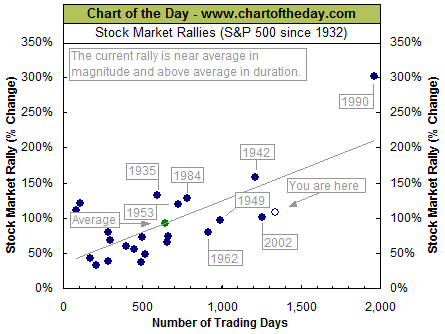 "With the S&P 500 once again in record high territory, today's chart provides some perspective on the current rally by plotting all major S&P 500 rallies of the last 86 years. With the S&P 500 up 107% since its October 2011 lows (the 2011 correction resulted in a significant 19.4% decline), the current rally is above average in magnitude and the second longest rally since the Great Depression." 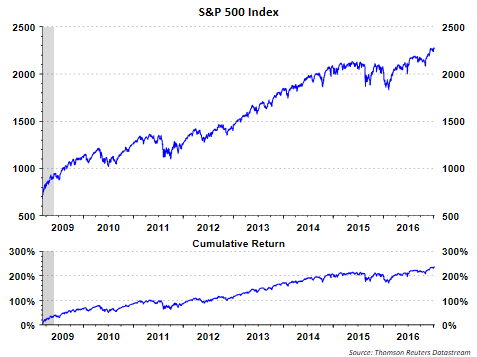 - A major stock market rally has been defined as a S&P 500 gain of 30% or more (following a correction of at least 15%). - The S&P 500 was not adjusted for inflation or dividends. - Selected rallies were labeled with the year in which they began. - There are 252 trading days in a year (100 trading days equal about 4.8 calendar months). The U.S equity market has certainly had a nice recovery since the financial crisis low in 2009. The magnitude and length of the recovery may have some investors contemplating selling their equities in favor of sitting on the sidelines until the next pullback. 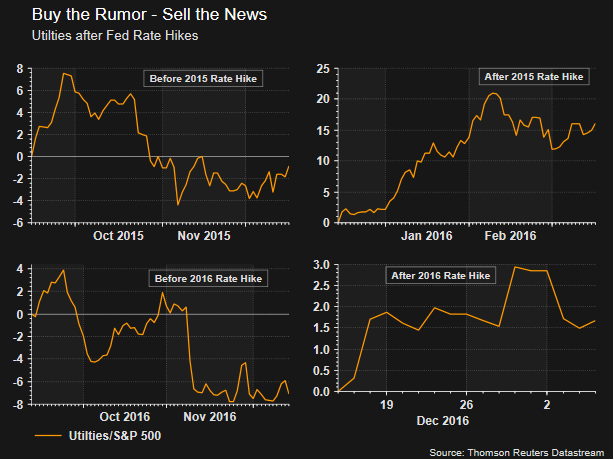 The old investing adage “Buy the rumor, sell the news” comes to mind following the “Trump Rally” to end 2016. As we all know, President-Elect Trump has not yet been sworn into office and yet, the year-end climb in US markets has been mostly attributed to his policy proposals. This makes sense as the market is always forward-looking, but it is important to keep in mind that it often overshoots in the near term. As a prime example, the chart below shows the relative performance of the Utilities sector against the S&P 500 in the three months before (left) and after (right) the two most recent Fed rate hikes. The line moving higher indicates Utilities outperforming the S&P 500 and lower indicates Utilities underperforming. As any market participant would tell you, this conservative/high income sector should suffer from an increase in interest rates. And it did, but all of the underperformance came before the actual event (Fed rate hike) and subsequently, Utilities dramatically outperformed (short-term). The surprise victory of Donald Trump in the Presidential election brought about a dramatic market rotation that benefited cyclical sectors like Financials and Industrials. 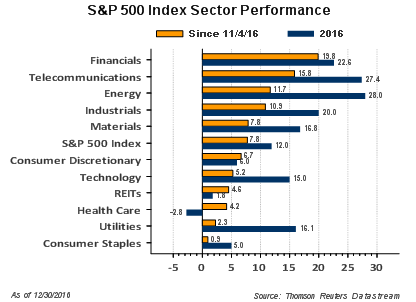 Cyclical sectors outperformed due to the widespread belief that Trump’s pro-business policies could boost domestic economic growth. "cash reserves also set a new record for the third consecutive quarter, as S&P 500 Industrial (Old), which consists of the S&P 500 less Financials, Transportations and Utilities, available cash and equivalent now stands at $1.49 trillion, up 8.2% from the prior record of $1.37 trillion. The current cash level is nearly double [that] of expected 2017 operating income, giving corporations leeway in their expenditures." Information Technology continued its buybacks dominance, even as its overall percentage of S&P 500 buybacks decreased to 23.2% ($26.0 billion) in Q3 2016, from 23.6% ($30.1 billion) in Q2 2016. 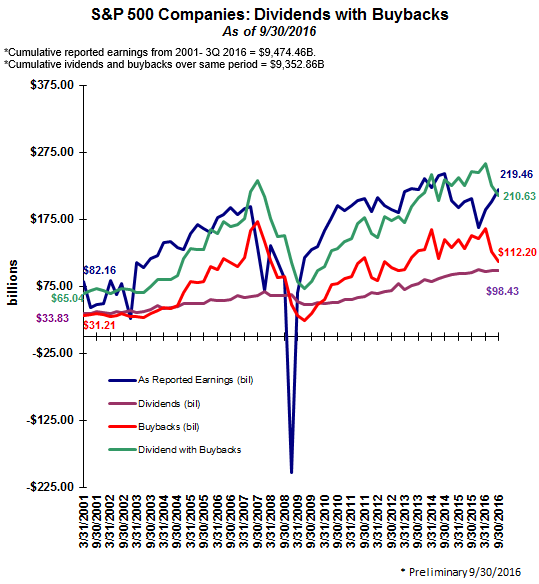 Apple (AAPL) spent the most on buybacks in Q3 2016, at $6.0 billion, down from $10.2 billion in Q2 2016 and $13.3 billion spent in Q3 2015. Microsoft (MSFT) was second, with $4.4 billion, up from $3.7 billion in Q2 2016. Energy saw its contribution increase but overall expenditures decline, to 1.20% ($1.34 billion) in Q3 2016, compared to 1.09% ($1.39 billion) in Q2 2016 and 6.07% ($8.8 billion) in Q3 2014. Industrials decreased its expenditures by 39.4% ($13.3 billion) from $21.9 billion in Q2 2016. Consumer Staples which decreased its expenditures by 28.4% ($8.4 billion) after $11.7 billion in Q2 2016. In our Fall 2016 Investor Letter we discussed how emotions tend to run high around certain periods like the recent U.S. election. We noted in that newsletter that emotional investment decisions can drive investors to reduce their stock market exposure and harm long term returns. Certainly, the equity market performance following the the November election was one that strongly rewarded investors that stuck with their investment discipline. 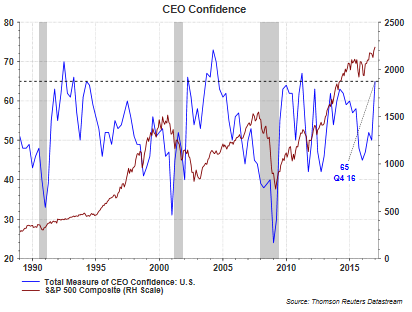 Our recently published Winter 2016 Investor Letter discusses the broad improvement in confidence that is showing up in a number of economic variables. The improvement in consumer confidence is important as the consumer accounts for nearly 70% of economic activity. Also included in the newsletter is commentary around the rise of the "Populist Movement' from the BREXIT vote in June to the Italian Referendum in December. While we take no stance on the merits of such movements, it is undeniable that recent elections have dramatically altered the state of western politics and the policies that may be pursued will have an impact on ones investment portfolio as we review the year ahead. 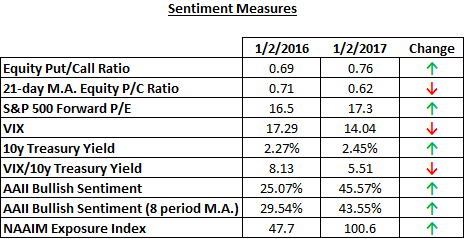 Yesterday I wrote that investor sentiment is broadly more bullish at the start of 2017 versus the beginning of 2016. 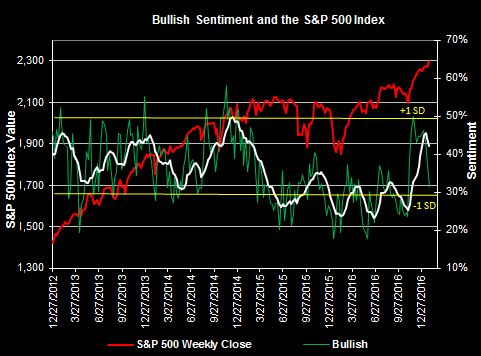 Elevated bullish sentiment tends to be a contrarian indicator and can coincide with near term market tops. 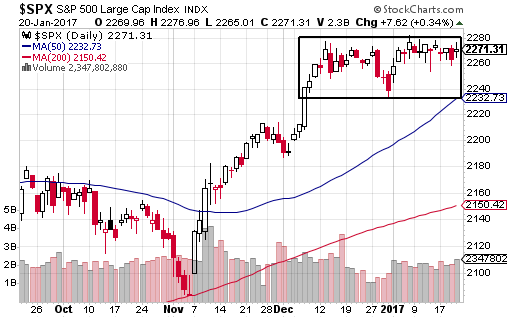 Now having noted the heightened sentiment measures, but shifting to a technical view of the market, some market excess has been worked off in the last few weeks of December with the S&P 500 Index down 1.4% since December 13th. 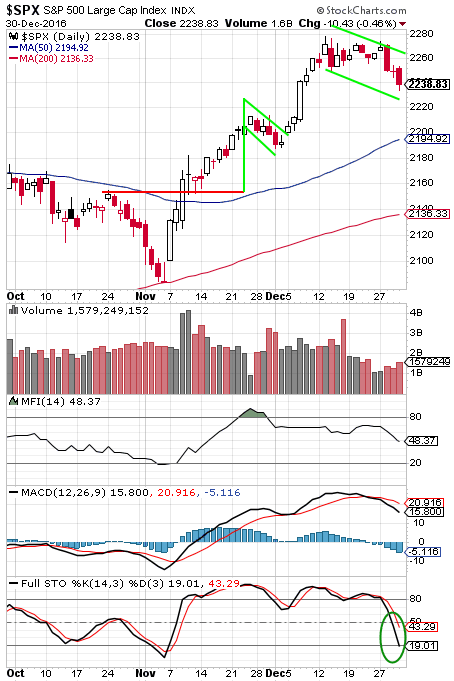 As the above chart shows, the late December weakness has created a bull flag formation during this two week period with the market trending lower. Additionally, the Money Flow Index (MFI) has retraced to a more neutral level while the stochastic indicator is near an oversold level.